For writing and remembering...erasing too. Every time I pick up this pencil, which is often, as I like to scribble in the books I read, I think of the author, Rodes Fishburne. Rodes gave out plain yellow pencils with the simply words GOING TO SEE THE ELEPHANT BY RODES FISHBURNE stamped on the side at his reading in Oakland, California. It was clever this little marketing device, I though as I shoved it into my purse. After his reading, we had drinks across the street, where he and my husband discussed abalone fishing, and I met his wife while standing next to my best friend and discussed her book too. Sure, it’s a little corny to say, but now when I look at this pencil I think not only of Rodes (and that night) but also of San Francisco, where the novel takes place and which is also my de facto hometown, having moved recently from there to a place that is only recently even a country. I’ve used this same pencil to create unruly to-do lists in my Moleskine notebook while working there, sign real estate papers when we sold our house, and did crosswords on my last flight out of the Bay area. 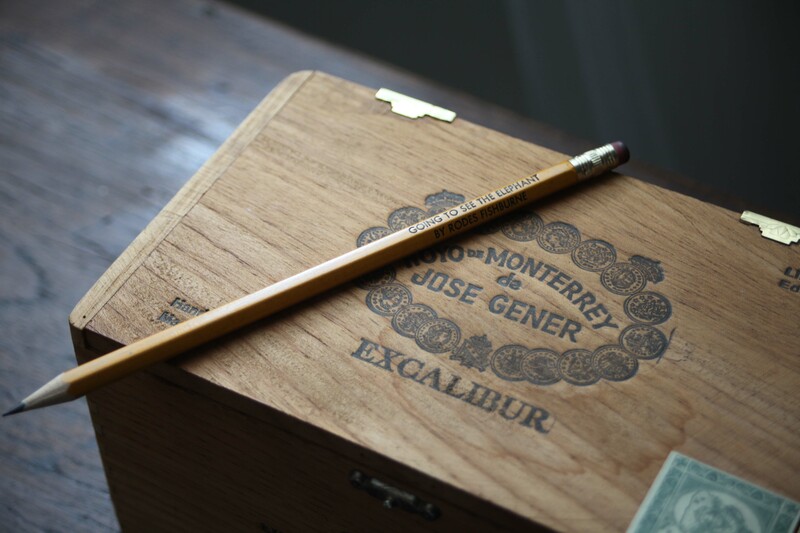 This pencil reminds me of all the softball games in Berkeley I played, the roasted goat at Camino, the Chie Mihara’s at Gimme Shoes in Hayes Valley, and all the Sunday mornings my husband surfed while I sat on the front porch smelling the jasmine. It’s farmer’s markets, eucalyptus trees, wine tastings, bookstores, and the dry dry hills of Marin County. Authors, take note…preferably with a pencil. Thanks Brian…It’s my daily landscape.